Early symptoms of wet AMD can be as terrifying as they are debilitating - faces are blurred, blind spots appear in the centre of vision and straight lines seem to waver. If left untreated, patients can lose their sight within three months. Wet AMD (age-related macular degeneration) is an aggressive, rapidly developing condition in which abnormal blood vessels form in the macula, the part of the eye responsible for vision, resulting in scarring. It is also the leading cause of blindness in those over 60. Wet AMD is usually seen in this age group and genetics are thought to play a major role, although smoking and exposure to sunlight are also risk factors. However, a new NHS treatment is offering hope to the 250,000 UK sufferers. 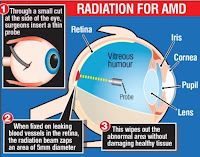 The revolutionary surgical procedure uses beams of radiation to destroy the abnormal blood vessels at the back of the eye that are the cause of sight loss. Currently, patients suffering from AMD are treated with regular injections of a drug into the eyeball. These are required up to every month, usually for the rest of their life. With the new procedure, called epimacular brachytherapy, surgeons thread a probe into the eye until it reaches the abnormal area in the retina. They then give a precisely timed dose of radiation in a beam just 5.4mm wide. Research into epimacular brachytherapy shows the radiation is safe. Unlike previous forms of radiation therapy for wet AMD, the peak dose is targeted directly to the abnormal vessels, minimising damage to healthy surrounding tissue. The one-hour operation is carried out as a day-case ophthalmology surgical procedure under local anaesthetic. Tim Jackson, consultant eye surgeon at King's College Hospital in London, says: 'This is a relatively straightforward procedure. And unlike the injections, which need repeating on a regular basis, the beauty of this technique is that it is a one-off treatment. The technique, now available on the NHS, is being trialled on 363 patients at 15 hospitals around the country. Researchers are appealing for more participants. The radiation therapy costs about £6,000 privately. So far, the results have been encouraging. Preliminary studies show that 91 per cent of patients maintain vision. One success story is that of Margaret Findlay, 84, from South London. Margaret had always been staunchly independent, so when two years ago she rapidly started to lose her sight, it was all the more difficult to come to terms with. Within weeks, she had to give up driving and ask family and friends for help with chores, especially shopping. When she saw her GP in February 2007, he referred her to Mr Jackson, who diagnosed wet AMD. He offered her epimacular brachytherapy.